Mansfield, 70 @ Canton, 43 – Final – Click here for a photo gallery of this game. Canton held 26-25 at halftime but Mansfield outscored the Bulldogs 24-9 in the third period to take control the game. Mansfield had a 45-17 advantage in the second half. Senior Tommy Dooling had a team-high 15 points, sophomore Matty Boen added 13 points and six rebounds, and sophomore TJ Guy finished with 12 points and seven boards for the Hornets. Canton senior Ryan Lentol finished with a team-high 13 points and six rebounds. Franklin, 57 @ North Attleboro, 33 – Final – Franklin created all the separation it needed with a big first half. The Panthers led 17-4 after one and took a 31-10 advantage into the break. Junior Chris Edgehill scored 14 of his game-high 18 points in the first half for Franklin while Jalen Samuels and Will Harvey each added 10 points. North Attleboro senior Josh Montague scored a team-best 12 points while junior Ethan Friberg had nine points. King Philip, 73 @ Stoughton, 55 – Final – King Philip trailed by nine at halftime but used a monster second half to beat the Black Knights. The Warriors won the third quarter, 23-6, to turn a deficit into a 50-41 lead going into the final quarter. KP added 23 more points in the final quarter to earn the win. Senior Bruce Saintilus scored a career-high 24 points while Andrew McKinney and Alex Fritz both scored 19 points, a career-best for both players. Stoughton junior Obinna Ugwuakazi finished with a team-high 20 points while Zak Paquette recorded a career-high 18 points for the Black Knights. Taunton, 59 @ Milford, 47 – Final – Holding a 33-26 lead at halftime, Taunton held the Hawks to seven points in the third quarter to create a double-digit lead that it never relinquished in a win over Milford. Taunton senior Lou Vendrell scored eight of his 14 points in the third quarter while Mike Qunn (10 points) added a triple to help the Tigers build a 49-33 lead going into the final eight minutes. Taunton junior Dante Law scored a team-high 15 points, including 11 in the opening quarter. Junior Colby Pires and sophomore Jordan Darling each scored 11 points for Milford. Oliver Ames, 64 @ Sharon, 50 – Final – Sharon held a one-point lead with three minutes to go in the third quarter but Oliver Ames finished strong, doubling the Eagles’ production down the stretch (30-15) to earn the win. Ethan Eckstrom scored six of his team-high 15 points in the final quarter and Owen Friel (career-high 10 points) connected on a pair of three-pointers in the fourth to help the Tigers pull away. Senior Sean O’Brien and sophomore Amari Brown each added eight points for OA. Sharon junior Aidan Kane scored a game-high 17 points while classmate Caleb Gayle added 14 points, 10 rebounds, and three blocks. Canton, 51 @ Mansfield, 57 – Final (OT) – Mansfield’s Emily Vigeant hit a three-pointer with seven seconds left in regulation to force overtime. The Bulldogs got balanced scoring, led by Sydney Gallery’s 12 points. 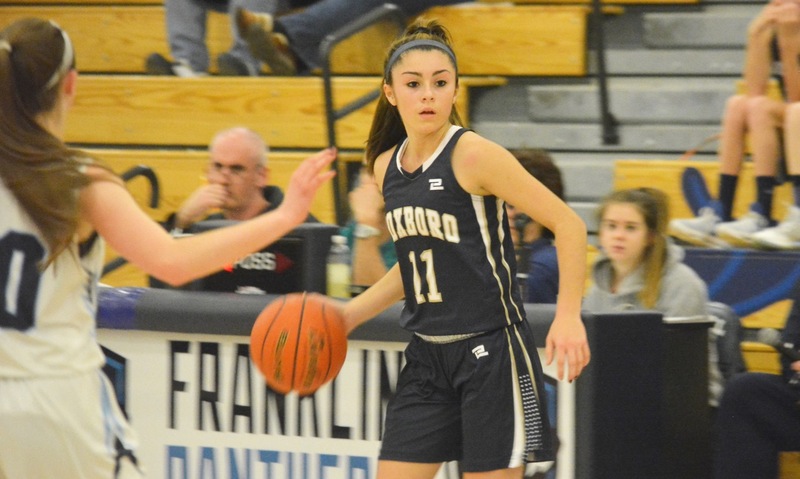 Kiara Cerruti scored 11, Maggie Connolly had nine, and Julia Hamilton added eight points for Canton, which had its five-game win streak come to an end. North Attleboro, 33 @ Franklin, 57 – Final – Ali Brigham had 25 for the Panthers in the win. Stoughton, 31 @ King Philip, 73 – Final – KP jumped out to a big lead early in the game and never looked back, as the Warriors clicked on the offensive end of the floor for their sixth win of the season. Faye Veilleux scored 21 points and Julia Leroux added 18 points (on six three-pointers) to spark KP to the win. Shannon O’Connor scored eight as well for the Warriors. Milford, 23 @ Taunton, 61 – Final – Click here for a Photo Gallery from this game. Taunton went on a 25-2 run after Milford opened the scoring and took control of the game before halftime. Alexa White led the way for the hosts with 15 points, while Kelsey White added 12. In the fourth quarter, freshman Abby Souza came off the bench and scored 11 of her 13 points. Ashanty Barreto led the Hawks with six points and Emma Lawrence added five points and 13 rebounds. 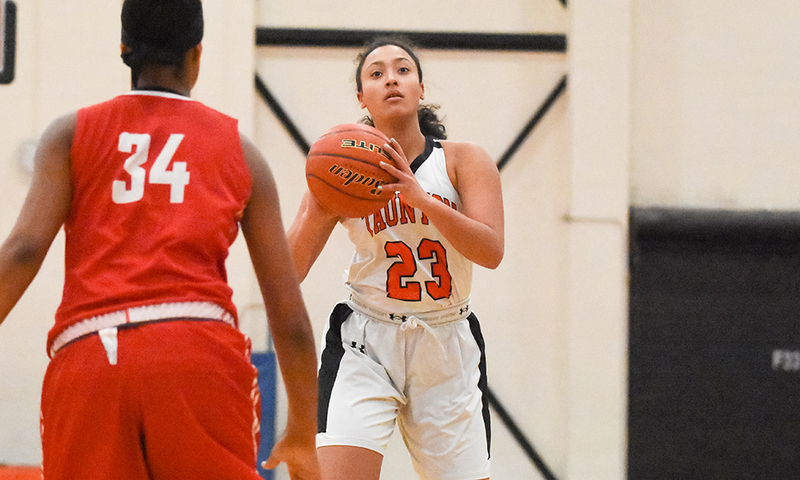 Sharon, 50 @ Oliver Ames, 75 – Final – Oliver Ames scored 41 points in the first half, building a 10-point lead at the break, and never looked back to earn the win over Sharon. Freshman Caroline Peper poured in a career-high 25 points to pace the Tigers while Caroline Flynn had 10 points and 10 rebounds.